On Friday, November 6, I was able to visit with my two brothers, Oleh and Eugene, and three nieces, Nadia, Natasha and Lauren, in New York City. We decided to spend the day at the Statue of Liberty and Ellis Island, the entry point for millions of immigrants to the United States. Visiting Ellis Island was of particular interest to me since I, too, came through here almost 50 years ago with my parents who were World War II refugees. I am very grateful to be an American Citizen. It is not without emotion and that I revisited Ellis Island. It signified entry into a land of freedom and opportunity which makes one think of inspiring spiritual parallels. 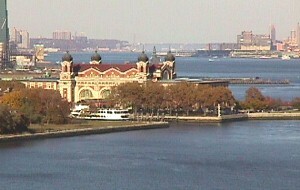 Fifty percent of all Americans can trace their roots to Ellis Island which was the processing point for the newcomers. Incoming ships docked on the Manhattan's West Side. Passengers were then transferred to another vessel which ferried them to Ellis Island. Here they would go through a medical exam and questioning before being allowed entry. Ninety-eight percent passed the test. Those rejected had to return to where they came from. Before being allowed into the United States immigrants had to prove they were healthy, that they would not be a burden to the new land. They had to have no blemish on their record as criminals. Once they were approved, they were taken to the New Jersy side and boarded trains to their destinations in the New Land. Those not approved parted in tears and were sent back by steam ship. I continue to be awed by the New York City area. The harbor, the cavernous buildings making up Manhattan, the bridges, tunnels and subways are unique. A line of helicopters ferried people from the Jersy side to downtown Manhattan. The diversity of people and non-stop activity is unlike any other place on earth. It's a great place to visit...and (for some) to return from. We stayed with Larry and Rose Marie Kuhn on Long Island. On Friday morning we drove through Manhattan to its southern tip, Battery Park. From there the boat leaves for the Statue of Liberty. 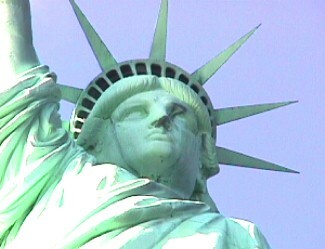 When we got to Liberty Island, we got in line and climbed the 300 plus steps to the top of the famous monument. You climb normal-sized stairs through the pedestal and then into the statue itself. The stairs narrow and then spiral upward...getting tighter and narrower as you enter the crown of the Lady's head. From there you can view the harbor and have a fabulous view of the Verazzano Narrow's bridge linking Brooklyn with Staten Island. After visiting the statue, we made the pilgrammage to Ellis Island by Park boat. One has to image all the hustle bustle noise and activity when this building processed the millions that passed through it. It made me compare our entry into the Kingdom of God, an everlasting land of liberty and opportunity. But, one must be ready, healthy and not be a burden. One must be ready to contribute and dress and keep the land. Outside the Ellis Island Hall of Registry a Wall of Honor contains the names of various immigrants and families. I was able to photograph our name. This became reminiscent of the Book of Life in Revelation. Our names, too, must be written in the Book of Life. It was a wonderful day to visit with my family. The day ended with a quick flight back home to Indianapolis, Indiana.